How to get there: A natural starting point is Lake City. Go to the end of Second street and turn left on Henson Creek Road, there is a sign there for Engineer Pass. Follow this road for about 15 km as measured from the intersection of Main and Second Street in Lake City. There are some old buildings in this area called Capitol City, more importantly, there is a road going right (north-west) along North Henson Creek. (There may be a sign saying Forest Service Road 870). Take this road, it quickly becomes rough, a 4WD can follow the road to a parking area with a gate, after about 4 km. We pitched our tent in a nice spot just below the end of the road. Route description: The route first follows the old road, then forks left and gains some elevation via a couple of large switchbacks. As the trail comes out above treeline, one should pay close attention, the route to Wetterhorn heads into the basin towards Matterhorn, then turns left along a small creek and climbs the south-east ridge. If one follows the trail too long (as we did), then a couple of very distinct creeks with fairly deep, V-shaped gullies must be crossed. 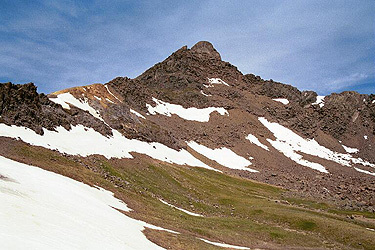 The best route is likely to leave the trail immediately after crossing the second creek after treeline. (These creeks are close together, the second one being the bigger of the two.) Head into the basin on a very nice open meadow, then turn left before a more rocky hill formation. We climbed steeply on grass a small ridge that points east from the main ridge, thus avoiding a large bank of snow. As the main ridge is reached, just follow it until it becomes rocky. From this point, the route stays to the left of the main ridge crest and partially climbs some gullies heading upwards. Higher up, there is easy scrambling passing some larger rock formations and then finding a very distinct, narrow crack in the rock that one should pass through. On the other side of this crack on easily climbs up and regains the main ridge crest. The next section is a fairly long, horizontal traverse on the right side of the ridge. This is, I think, the most unpleasant part of the climb, lots of loose rock and scree, above cliffs that provide some exposure. One should be extra careful on this section, there are no technical difficulties, but the terrain is steep enough to carry potential for an accident. Finally, after ascending towards the end of the traverse one climbs into a level area just before the main summit, having passed the rock formation called the Ship's Prow. There are two notches straight ahead between the Ship's Prow and the main summit. Take the smaller notch which is to the right and closest to the main summit. 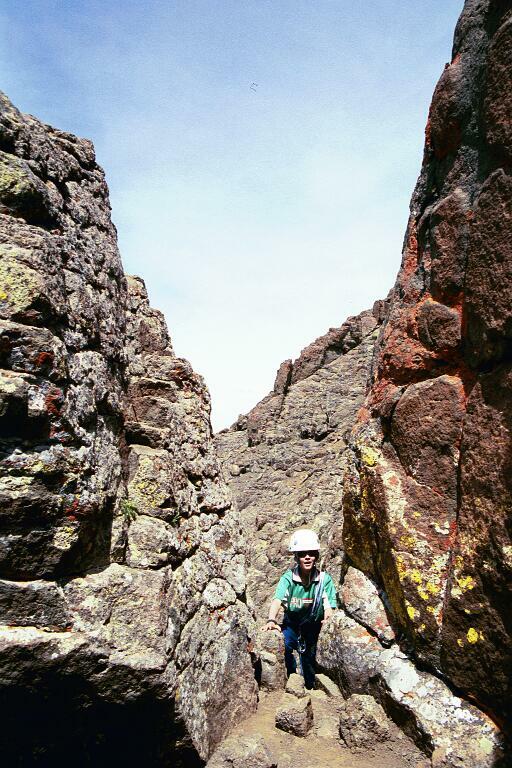 Behind this notch is an elegant slab of rock that leads into the final section of the route. The final section is a good climb on solid rock up a nice gully. The climbing here is fun and the rock consists of "stairs", small horizontal shelves all the way. 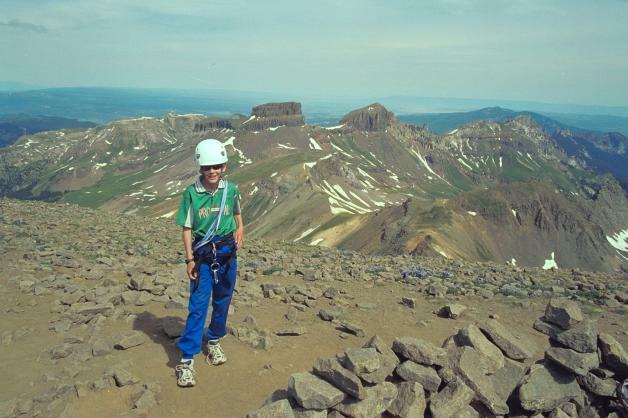 At the very end one can traverse a bit left on a ledge and then gain the summit, however, it is more fun and not hard to continue the climb straight up until you get your head above the flat summit plateau. The feeling of sudden arrival is then prominent. The summit is flat and with ample space, it can be highly recommended to spend time at this place, just sit there and enjoy the peaks around. Comments: This mountain is named after the more famous Swiss mountain Wetterhorn (elevation 3701 m). The Swiss Alps have had significant influence in this area since the even smaller peak between Wetterhorn and Uncompaghre has been named Matterhorn. I did this climb with Pål Jørgen, age 12. We left the 4WD trailhead in Matterhorn Creek at 0715 (we had stayed there in our tent), on the summit after 3 hours at 1015, spent a full 45 minutes all by ourselves on this spectacular summit. The descent down the ridge took about one hour and we were back at the tent at 1315, a very memorable 6 hour climb. Wetterhorn Peak, the entire south-east ridge with the Ship's Prow is visible from the basin below. The notch, between the Ship's Prow and Wetterhorn that leads to the slab connecting the final part of the route. 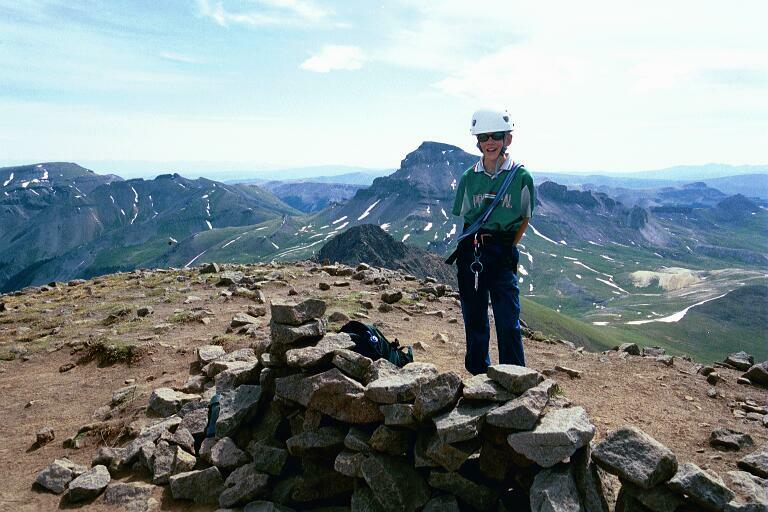 On the summit of Wetterhorn, Pål Jørgen with Uncompaghre behind. On the summit of Wetterhorn, Pål Jørgen with Coxcomb behind.